Filler - an exciting puzzle game. Filler is an exciting puzzle game for whole family or personal fun. This game is splendid antistress and antidepressant game. You can use it as development and very interesting game for your children. 100 layouts of the field and 100 levels in advanced game, 100 levels in classic game, 11 special bonuses, graphic designed by masters of Russian Khokhloma painting - this is the short list of game features. Game rules of this puzzle are extremely simple. 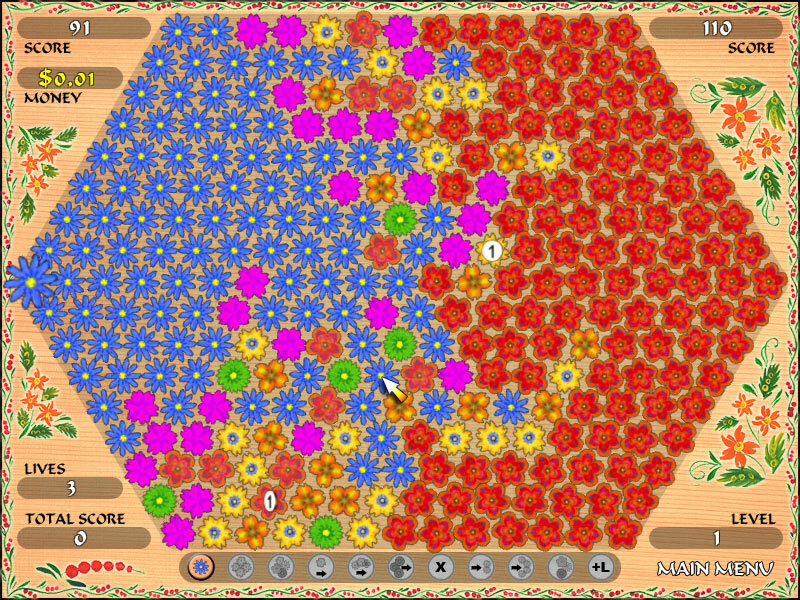 Your objective is to occupy the half or the majority of the flowers on the field. You always start a game from the left side. Computer always starts from the right one. You always make the first move. Filler has two modes of the game : classic puzzle and advanced puzzle. In advanced puzzle mode you will see black flowers that you can't seize. These flowers make this mode very puzzling. To enlarge the size of your zone you should seize adjoining flowers. Just click on the flower of different color, bordering to your zone, and all the flowers of given color turn into yours. Computer player does not always move the same. Sometimes he plays poorly, but sometimes you will need to do your best to win. Try to seize the flowers with coins. It will let you buy bonuses, which help you in the game. Rainbow Web takes you on a fun adventure to the land of fairies and elves. Spider, an evil wizard, has cast a spell over fairy creatures and spun a web over their kingdom. You must solve 60 puzzles to break the spell and return the land to sunshine. A totally new twist on classic puzzle game, Puzzle Myth is an addictive game for the whole family. Inlay mosaic with beautiful gems and find ways to combine gem images so as to get bonuses. Score points and enjoy the relaxing atmosphere of the game. A uniquely challenging puzzle game for strategists of all levels from children to grand masters. BrickShooter is not just for people who can think and move fast. It's for anyone who enjoys solving puzzles and taking their own sweet time doing them. Search long-lost treasures in pitch black caves, pyramids and dark tombs of ancient temples. Huge gemstones were sheltered from the sunshine for eons of time waiting for those who are brave. You as an intrepid tomb seeker must resolve puzzles. O Filler is an exciting puzzle game for whole family or personal fun. This game is splendid antistress and antidepressant game. You can use it as development and very interesting game for your children. See above information and user's reviews about Filler Filler is an exciting puzzle game for whole family or personal fun.